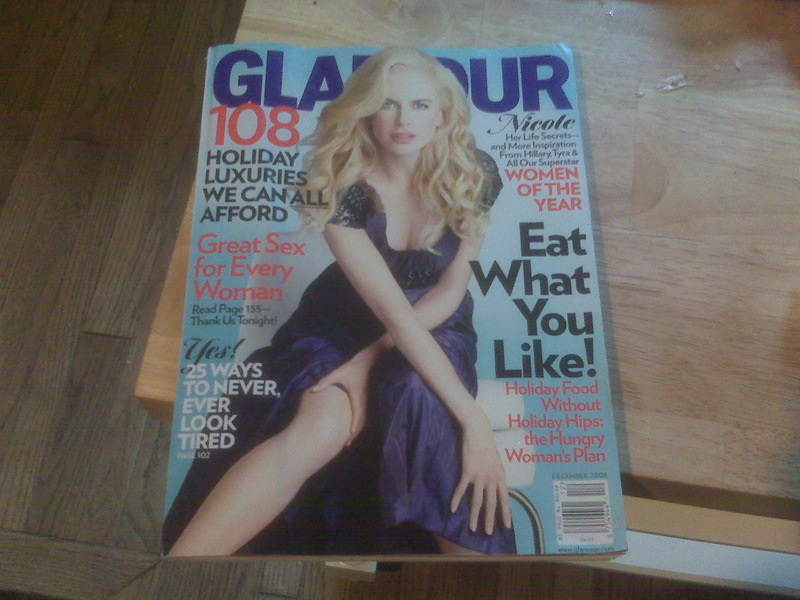 As if to prove my point, today I was walking through my kitchen and Jennifer had left one of her magazines on the kitchen island. It caught my eye only because I thought, for a second, I was passing by a picture of Nicole Kidman showing her vajayjay. The left arm placement brings the eye up her right leg, and to the peripheral vision the arm is but a continuation of the leg, right up the dress, to the shadow created by her left arm. That shadowy area, to the passive visual processing center, naturally appears to be a hint of some nether-region on high glass paper. Out of the potentially hundreds of shots taken during that photo shoot, this one was chosen… why? It really is a brilliant attention getting mechanism. This entry was posted on Sunday, November 16th, 2008 at 9:48 pm	and is filed under Life in general. You can follow any responses to this entry through the RSS 2.0 feed. You can leave a response, or trackback from your own site.